Philip Daniel Saunders was born on 23 February 1955, in Cleveland, Ohio, USA. He was a basketball player and coach, best known for coaching various National Basketball Association (NBA) teams like the Minnesota Timberwolves, Washington Wizards and the Detroit Pistons. He had raised his net worth significantly prior to his death. 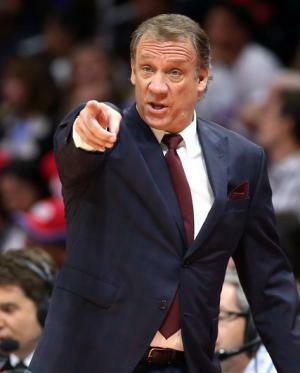 How rich was Flip Saunders? At the time of his passing, sources inform us of a net worth that was at $30 million, mostly earned through a successful career in coaching. He worked his way up coaching and eventually got noticed by the NBA. Aside from coaching, he also became a basketball executive which helped in raising his wealth. Flip started his career in basketball playing for the Cuyahoga Heights High School in Cleveland; he was the Ohio Class A High School Basketball Player of the Year during 1973. He then attended and played at the University of Minnesota and teamed up with players like Kevin McHale and Ray Williams. After college, Saunders decided to work on a coaching career. He began coaching at Golden Valley Lutheran College, where he earned a total 92-13 record and a perfect 56-0 at home. In 1981, he became the assistant coach for the Minnesota Golden Gophers for five seasons, and then became an assistant coach for the University of Tulsa for two seasons. In 1988, Flip joined the Continental Basketball Association (CBA) and became the coach of the Rapid City Thrillers. After a season, he moved to coach for the La Crosse Catbirds for five seasons, winning two CBA championships in the process. He served as General Manager and team president for the Catbirds, and then went to coach the Sioux Falls Skyforce. After seven seasons with more than 30 victories each, he decided to move from the CBA to the NBA. His net worth was already well established. By 1995, he joined the NBA, becoming the general manager of the Minnesota Timberwolves. In late 1995, he became head coach and despite a losing record that season, it was the time star player Kevin Garnett started to earn recognition for his talents. By 1996, Saunders helped the Timberwolves reach their first playoff berth, and then the following year earn a winning record. They continued to make good records even reaching 50 victories in the 1999 and 2001 seasons. Their peak came in 2003 when the Wolves would eventually reach the Western Conference Finals. The following season however became a failing record for the team, and Saunders was fired as a result. In 2005, Saunders became the coach of the Detroit Pistons and helped the team earn a 64-18 record, and thanks to his coaching skills he was given the chance to coach the Eastern Conference during the 2006 All-Star Game. During the 2008 season, the Pistons lost to the Boston Celtics during the Eastern Conference Finals and it ended Flip’s tenure with the Pistons as coach. In 2009, Flip became the coach of the Washington Wizards, but had a poor record and after three years was fired. In 2014, he returned to the Timberwolves but would not be able to continue coaching due to a sickness. For his personal life, Saunders is survived by his wife Debbie(m. 1978) and their four children. His son became an NBA assistant coach and his daughters became members of the University of Minnesota Dance Team. During August 2015, Saunders announced that he was diagnosed with Hodgkin’s Lymphoma, a cancer that originates from white blood cells. He passed away during October 2015, and the Timberwolves grieved the loss. 1 Inducted into the University of Minnesota M Club Hall of Fame in 2004. 2 Named the Timberwolves' President of Basketball Operations on 3 May 2013. 3 NBA analyst for ESPN, 31 October 2012-May 2013. 4 Head coach of the NBA's Minnesota Timberwolves (1995-2005), Detroit Pistons (2005-2008), and Washington Wizards (2009-2012). Money Talks, but is Money the Root of all Evil?